Last night when I was worshipping with the College/University fellowship at SCommAC, this image came up on the lyrics powerpoint. It immediately struck me because the juxtaposition of wreath and thorny crown reminded me of a similar dichotomy I’ve been feeling since the release of our debut album. For ten months, the Hymn Remix Project had been my life: whether it was songwriting, planning, practicing, recording, or rehearsing, I was doing what I’d been called to do. Then suddenly it was over, and I found myself face-to-face with a crush of pre-holiday to-do’s that felt meaningless by comparison. Don’t get me wrong – I love the family gatherings and tremendous fellowship dinners, and I’m glad to bless people with thoughtful (or at least practical) gifts. 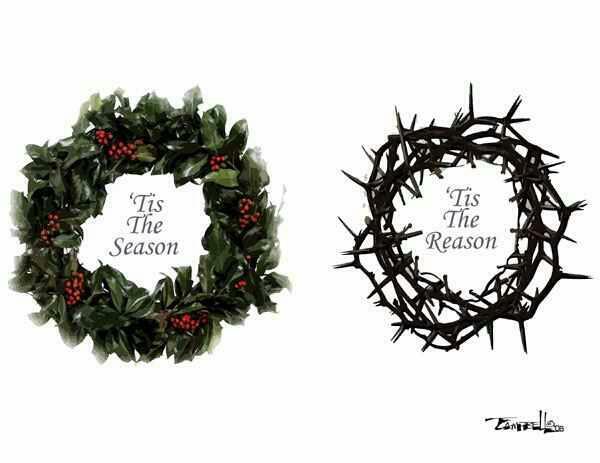 But with all the shopping and festivities, it’s easy to forget just how profound an occasion Christmas truly is. Christ wasn’t merely ‘born’. In coming to earth, he left his rightful place in heaven; in becoming human, he became subservient to God the Father and made himself nothing. So when we celebrate Christmas, we aren’t just celebrating Jesus’ birthday – we’re celebrating the ultimate act of humility in the entire history of mankind. Kinda puts the holidays in a whole new light, doesn’t it? Anyway, since this is probably our last update until 2013, we want to close off the year by officially thanking everyone for the incredible amount of support and positive feedback we’ve received. We are grateful and humbled each time someone comes up to tell us that a particular track is their favourite, that they really like a certain chorus, or simply because they want to buy a CD. We also have one more video – a documentary short about the Hymn Remix Project: the vision behind it, how the music came together, and testimony of how God can use ordinary people in extraordinary ways. After seven months of arranging, songwriting, planning, and prayer, the Hymn Remix Project is ready to move forward! We’re less than three months away from releasing the album, so it’s time to say goodbye to the countdown timer and hello to actual content. This is an acoustic demo of “Higher Ground,” a hymn originally written by Charles H. Gabriel. Our intended “wall-of-sound” feel doesn’t quite come through on a single acoustic (the album version is arranged for electric guitars), but we thought that standing in front of a mountain while singing such empowering lyrics would make up for the lack of overdrive. Hope you enjoy! The Hymn Remix Project © 2019. All Rights Reserved.